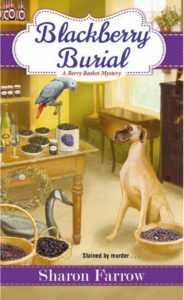 Blackberry Burial by Sharon Farrow is the second book in the Berry Basket Mystery Series. The cast of characters was so delightful that I didn’t want to put this mystery down. With the weather recently taking a cold turn in Ohio, I enjoyed getting to read a summertime mystery set along the Michigan shoreline. I loved how the author wrote an exciting story right from the beginning, with things to keep me guessing the whole time. One of my favorite things about starting a cozy mystery series that is already out is knowing that I can go back and read the first book in the series and spend more time with the characters right away. I absolutely adored Blackberry Burial and hope you’ll give it a try! In her former life, Sharon turned her hand to a variety of endeavors from principal investigator on an archaeological site, college history instructor, caterer’s assistant, and dancing in a giant dog costume for a non-profit company (it’s a long story). 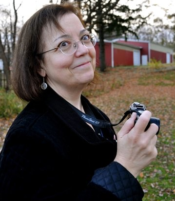 Although Sharon has lived in Rhode Island, New York and New Jersey, she calls Michigan home, specifically the beautiful coastline of Lake Michigan. Indeed, she is so enamored of the sand dunes, orchards and beaches of western Michigan, she set The Berry Basket mysteries in a town very similar to the one she is lucky to live in. While much of her time is spent hunched over a laptop, Sharon does take breaks to enjoy the nearby lakeshore and village marina, preferably while talking on her cell phone and sipping an iced coffee drink. Sharon’s reading and viewing pleasure spans everything from Louise Penny’s Inspector Gamache novels to the Real Housewives shows on Bravo. And she is currently trying to maintain a stiff upper lip until GAME OF THRONES returns for its final season.